106 Railway stations have been covered with CCTV surveillance system under ISS over Central Railway, Eastern Railway, East Coast Railway, North Central Railway, North Eastern Railway, North Western Railway, Northeast Frontier Railway, Northern Railway, South Central Railway, South East Central Railway, South Eastern Railway, South Western Railway, Southern Railway and West Central Railway. In addition, 139 Baggage Scanners, 32 Under Vehicle Scanning System (UVSS), 217 Door Frame Metal Detectors (DFMD) and more than one thousand Hand Held Metal Detectors (HHMD) have so far been provided under ISS. Issues concerning availability of eligible vendors, inspection of items, availability of budget, etc. were initially raised by Zonal Railways. These issues have since been addressed and all the Zonal Railways have been advised to ensure speedy implementation of ISS at all the identified sensitive stations. Besides ISS, CCTV surveillance system is available over 288 other railway stations. In addition, 983 railway stations have also been identified for installation of CCTV cameras under Nirbhaya Fund. Strengthening and upgradation of security infrastructure is an ongoing process. Accordingly, more stations will be brought under CCTV surveillance system alongwith other security equipment in due course. 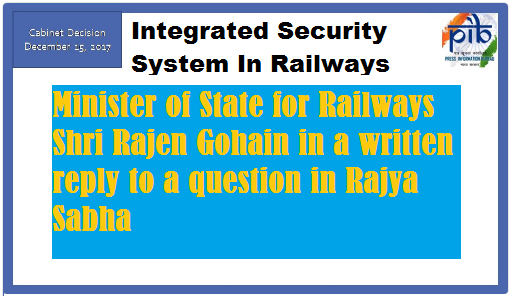 Integrated Security System (ISS) to strengthen surveillance mechanism at these stations. ISS includes Close Circuit Television (CCTV) Cameras, Access control, Personal and Baggage Screening System and Bomb Detection system.